COMMELL’s Half-size PISA(PCI+ISA) platform HS-871P based on Intel 82852GM and 82801DB Chipset, which offers a highly integrated low power, high performance chipset solution that has been optimized to On-board Intel® Mobile Celeron® 1.2GHz processor. Meanwhile, the Low voltage and Ultra Low voltage version supports on HS-871P The low voltage and Ultra Low voltage version allows you operate the system in the most tough environment. 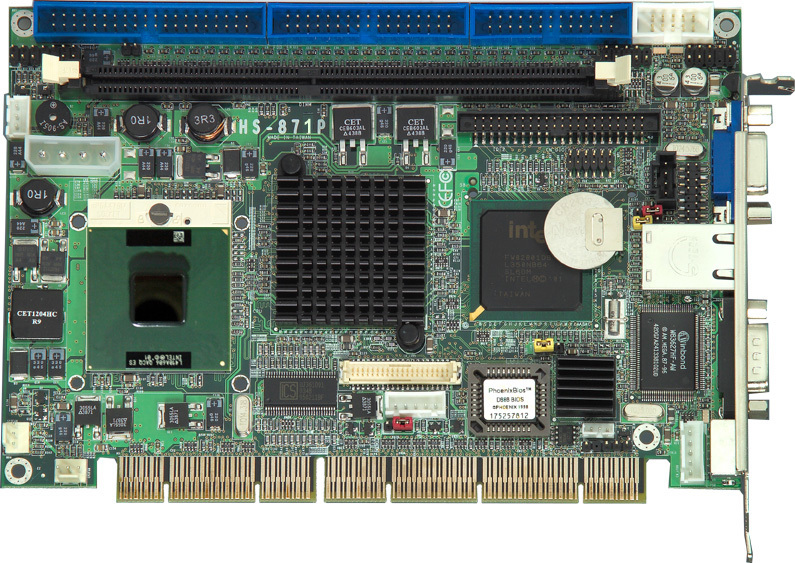 The HS-871P supports high speed DDR266 memory providing maximum capacity 1GB, integrated graphics controller with Intel Extreme Graphics 2 dual independent displays , The integrated display controller comes with up to 64 MB of dynamic video memory allocation and Single- or Dual-channel LVDS panel support up to SXGA+ panel resolution. The HS-871P comes with floppy, PS/2 Keyboard and Mouse, 2 x RS232C, 1 x Printer port, UltraATA 100 EIDE and IrDA interface on-board, Networking is provided by Intel 82541PI Gigabit Ethernet LAN. 2 x USB2.0 ports for 40X faster data transfer rate and backward compatible to support USB 1.0 devices and AC97 3D Audio are also integrated. Additionally, HS-871P is also equipped with CompactFlash Interface for easily using any memory card. Memory: 1 x 184 pin DDR DIMMs support up to 1.0GB DDR 266 SDRAM. Chipset: Intel® 82852GM and 82801DB. Enhanced IDE: dual Channels support 4 ATAPI devices up to Ultra DMA 33/66/100 mode with data transfer rate up to 100MB/s. LAN Interface: Intel 82541PI Gigabit Ethernet Controller. USB: 2 Hi-Speed USB 2.0 interface with up to 480 Mbps of data transfer rate. Intel 82541PI Gigabit Ethernet Controller.